I'm giving into the giveaway craze. Everyone loves free crap, right? Well, I'm giving away the large version of the Buttercup Bag (pattern by Rae Hoekstra) made by me in a yummy thrifted print that reminds me of my favorite season: Fall. 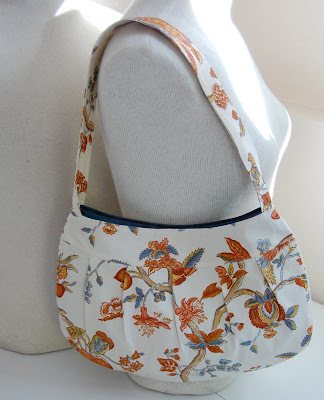 It's lining is a luscious blue (made from a thrifted chair cover) and has a small inner pocket as well as a metal snap closure. 1) Post a comment and you get entered once. 2) Blog about my giveaway and leave your hyperlink in a second comment and you get entered again! 3) Become a follower of my blog (on the ride hand sidebar) and you get entered a third time (please leave a separate comment saying that you completed this step). That's three chances to be entered in the giveaway, friends. I can't wait to hear what you think of the purse; I'm already dreading letting it go (good thing I have enough fabric for another one). I loved the first one (from the gold drapes)....this one is as lovely. What I really like is the classic style....very nice job sewing!!!! This is really cool. Love the pleats! I also liked the gold one. They both look very well done. I've done handbags before, but not with such a sophisticated-looking design (pleats and all). Great job! Me, me, me! I want it! I'm so not crafty and super jealous of all the amazing things you come up with! I am now a FOLLOWER as well, I want it ERIN!!!! Your amazing, I love it, maybe when I come down we can make one for me. How long does it take you? This is the coolest bag! I think referbished stuff is the greatest. You do great work. Wow! What a great bag. Thanks for deciding to do a "giveaway." I too am now a follower. . .
and I'm a folower now! Very pretty fabric! I'm a follower. Nice job . . . of course who doesn't like free stuff that is very nice! Great job . . . you should make and sell them too! I'm a follower. I love it! I'm with Heidi, you need to sell them. You know, in all your free time between, working, raising a son, being married to Scout, and taking care of the dogs, and all that good stuff. I don't know how you do it! Very nice seamstress work, my friend!! !